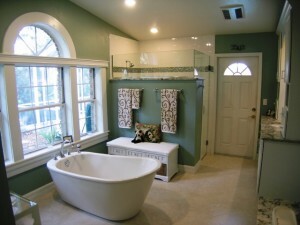 Being able to soak one’s cares away was high on the priority list for this project. 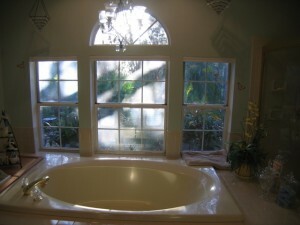 The troubles of the day wash right off when you are able to unwind surrounded by warm bubbles. Add a book and a glass of wine, and you may never want to leave. A peaceful, natural green for the walls was the starting point in this palette. 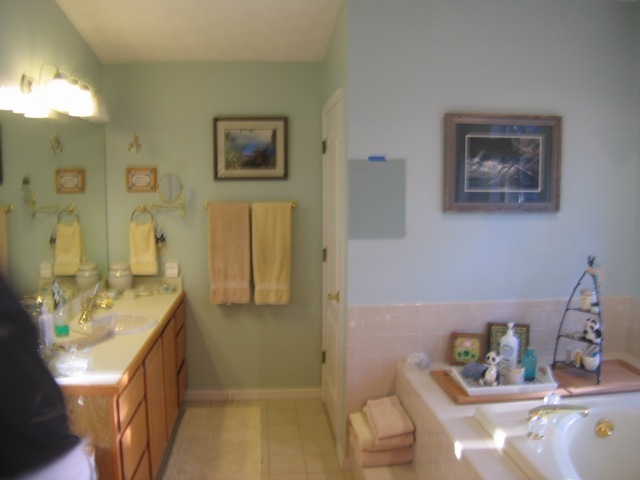 These health-conscious clients sourced a zero-VOC paint from YOLO Colorhouse (the color is called ‘Water.06’). Desiring a crisp simplicity, white plumbing fixtures and white tinted varnish vanities from StarMark Cabinetry contrasted nicely and allowed the green hue of the walls to pop. Tying them all together is a quartz countertop called ‘Praa Sands’ from Cambria, and a 1″ glass mosaic tile that blends all of the colors perfectly. Of course, it’s not problem if green isn’t your thing. 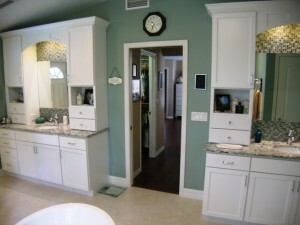 Stick with cool, restful colors instead of warm, passionate tones to work wonders on your stress level. Never underestimate the power of negative space. 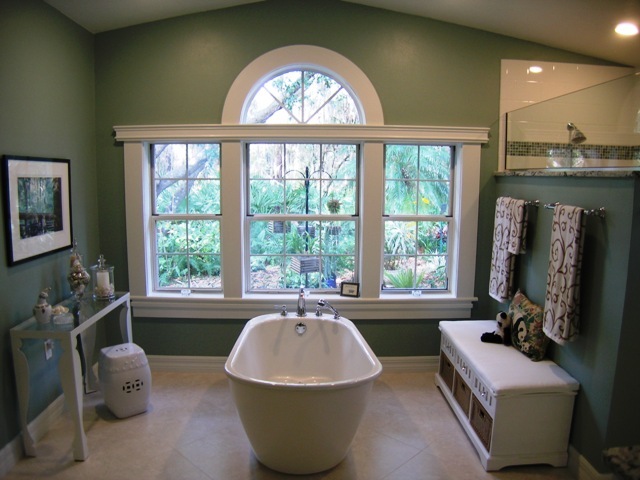 Originally, the big, step-up garden tub took so much visual space that it made the room feel cramped. 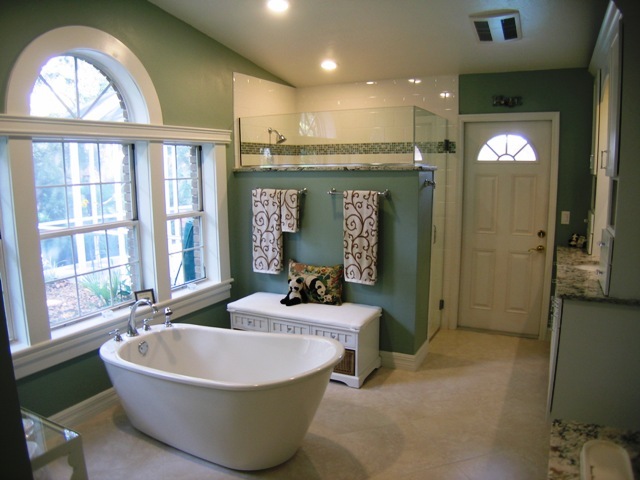 Opting for a free-standing soaking tub (we used the Sax from Maax), and more importantly, turning it perpendicular to the windows created floor space that allowed for both a bench seat and a decorative console table with room to spare. One potential pitfall in this project was the shower – the clients wanted the privacy of a solid wall instead of a glass enclosure. The solution? 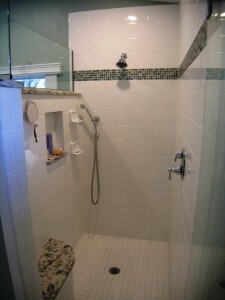 Create a shower that is larger than normal and build the walls only 2/3 high. 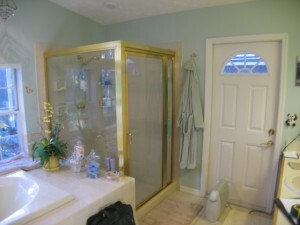 The result was plenty of elbow room and all the privacy the client desired. It’s hard to believe that we ended with more walls than we started, but the area still feels roomier. Not only do you need room for the necessities of life, you have to have space for the items you enjoy. Pampering is the entire point of a private spa, is it not? 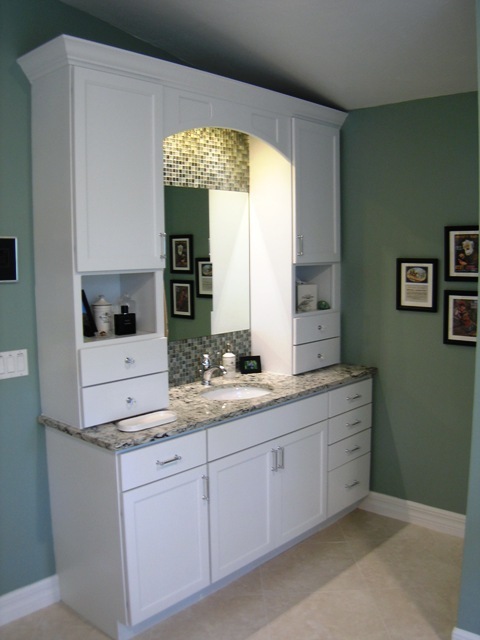 By using the Stratford doorstyle from StarMark Cabinetry for his and hers vanities, we were able to add all of the storage space necessary for some serious pampering, and at the same time create an inviting area that isn’t heavy or overpowering. This one is so often overlooked. Not only do you need light that lets you illuminate required tasks, but ambient lighting is a necessary component to create the proper relaxation mood. 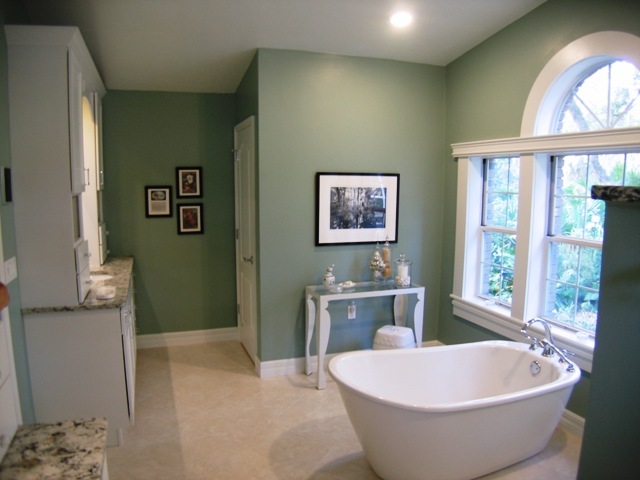 By taking advantage of the superb window in this space, we not only brought volumes of natural light in, but we had a natural focal point for the room. Can lights in the ceiling functioning on dimmers can create vibes at the touch of a finger. And recessed lighting over each vanity adds necessary task lighting, but by switching them separately, creates great ambient lighting after dark. This entry was posted in Design and tagged Master Bath, Relaxing, remodeling, Spa. Bookmark the permalink. Thanks, Beth! It was a fun project to work on.